We were scheduled to camp eight nights with a two night reprieve in El Maiten. To ease the pain we quickly established a ritual of a couple of stiff shots of whiskey at the end of the ride each day. Our second morning dawned clear and sunny, far brighter than the four who crawled stiffly out of their tents at sunrise. The condensation on the inside of the tents had frozen during the night, but as the sun rose over the mountains we could feel its warming grace even at this early hour. It was our first night sleeping on the ground and for a bunch of old geezers this was probably the hardest part of the trip. 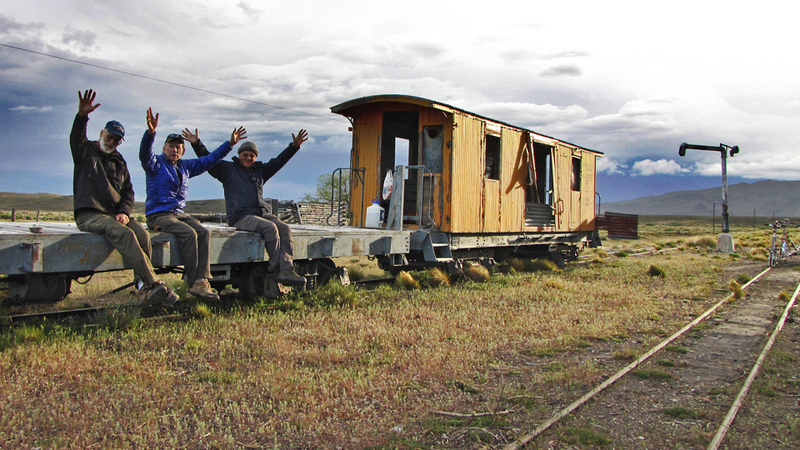 The baggage car at Fatalancao. Every evening was a unique experience. 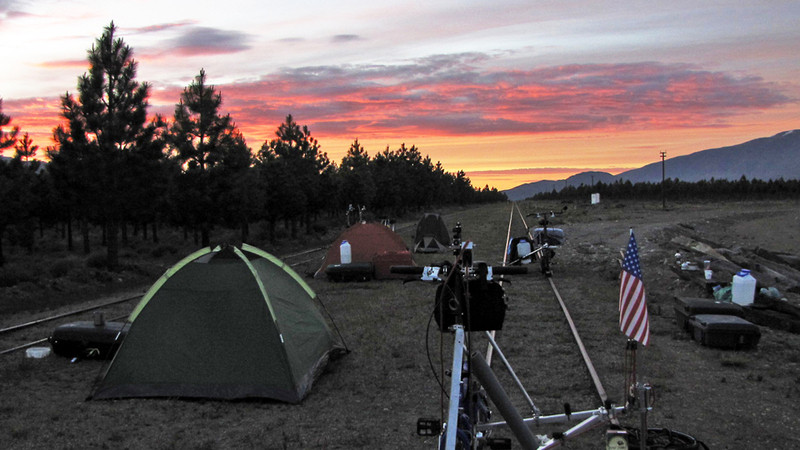 At La Cancha and Lepa, we camped in the grass next to the abandoned stations. 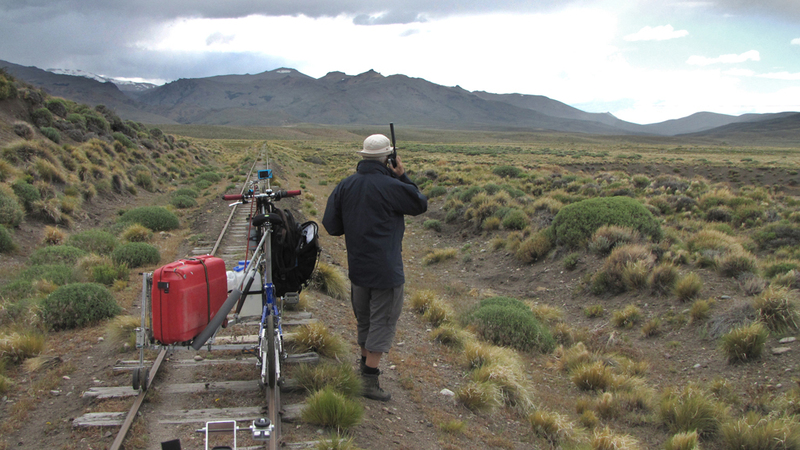 At Fitalancao, after a hard days ride and a threatening storm, we found shelter in an small abandoned baggage car. The doors and windows had been removed but it provided quaint shelter from a night that threatened rain. 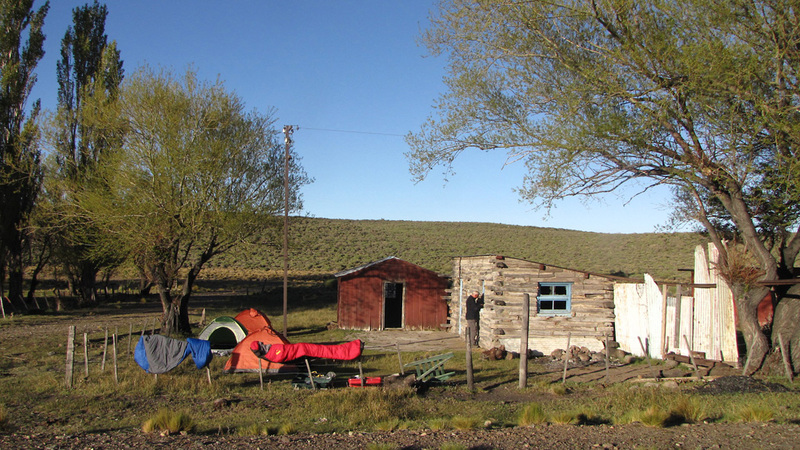 At Mamuel Choique we set up our tents on a station platform where the building was currently being used as a private residence. The locals told us the owner was visiting in Jacabacci, so we took our chances. At Desvio Thomae all we found was a pile of old railroad ties. The sunrise the next morning compensated for amenities. sometimes with gaps in between ties of two feet or more. Along much of the right-of-way, the railroad had piled dirt to the outside top of the rails as a means of preserving the ties from the elements. Our front wheel guides were designed to rotate backwards to allow us to pass over high obstructions, but the constant battering of rocks and gravel was annoying and interfered with most of our camera mounted video recording. Nevertheless, we have enough video to produce a full length movie which will be released late in 2010. Watch for it in your favorite movie houses. 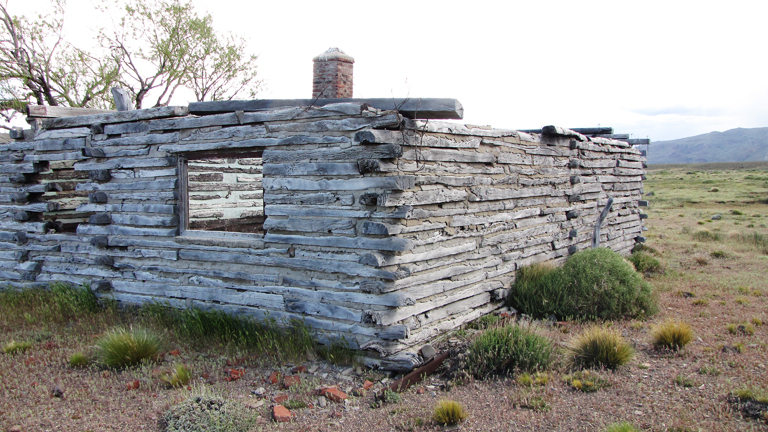 Typical building construction using railroad ties. giving him our location and our plans for the next day. Later we used the phones to coordinate with Morgan who provided support in a rented vehicle after he left the group in El Maiten. Arne confers with Morgan on a satellite phone as we approach the station at Fitalancao. It was our plan to have Morgan meet us each night at one of the abandoned stations. We lightened our load, giving him all of the luggage that was not absolutely necessary for us to carry. 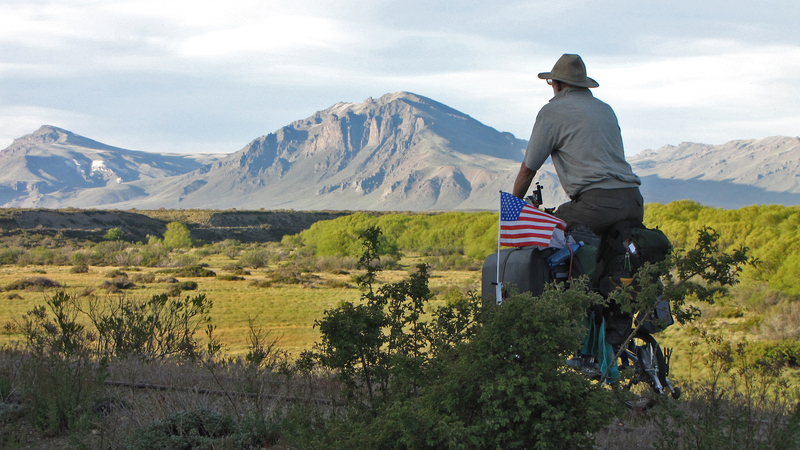 He was to check out our campsites in advance, bring extra water, and most importantly, cold beer. Unfortunatly, the road to the abandoned station at Fitalancao proved to be impassable. Morgan had to drive many miles ahead to the next spot where the dirt road met the railroad tracks, high on a mountain pass in the middle of nowhere. He slept alone in the car and waited 14 hours until we reached him the following day. In the middle of the night he was awakened by a knock on his window. A car had stopped on this lonely road to ask if he needed help. "No," he replied, "I'm waiting for my friends on the railroad." "But there are no trains," his would-be benefactors replied. "My friends are riding bicycles on the rails," Morgan explained. Beating a hasty retreat, his rescuers sped away, no doubt glad to have escaped this crazy gringo.